Ayushman Bharat Yojana Registration:- Under Ayushman Bharat Yojana, The Official is Now Inviting Hospitals to Join India’s Health Revolution. More Than 10.74 crore economically deprived families will get the benefit of Ayushman Bharat National Health Protection Mission. Online Application Forms are available now for the interested hospitals. It is also called Namocare or Modicare NHPS Scheme under which Rs. 5 Lakh Health Insurance will be given to the families. All over India Hospitals can apply for this Ayushman Bharat Mission or Yojana with certain eligibility criteria applied. The terms & conditions applied to register for the Ayushman Bharat Yojana Registration Application Process are explained below with the Description. The Online Registration for is Started & Many of the Hospitals & the People Want to Know How They can be a Part of Ayushman Bharat Scheme 2018 by Prime Minister Narendra Modi. The insides of Official Notification of National Health Protection Mission are given below. Check the point to point guide for Ayushman Bharat Yojana. ✍ The motive of this NHPS Scheme is to remove the flaws of previous Health-Care Schemes. ✍ More than 10 crore families or 50 crore individuals who are working in unrecognized sectors & economically weak will get an Rs. 5 lakh insurance for their family. ✍ Namocare or Medicare Scheme is completely cashless & people can go for treatment in Private as well as govt. hospitals. ✍ To Avail, this scheme people ill have to record their registration first at the official website of Ayushman Bharat Yojana. ✎ The Hospital must have At-least 10 Beds with Supporting Staff Members. ✎ General Ward Should be 80 Sq Feet with Amenities like Bed, Mattress, Electricity, Water, Linen Etc. ✎ Hospital Should be Equipped & Providing Continuous Surgical Services. ✎ Surgeon, Obstetrician, Pediatrician, Anesthetic & Maternity Services should be Available Round the Clock With Day Care Treatment. ✎ Blood Bank, Pharmacy, Dialysis Unit, Lab, Endoscopy Investigation Support, Ventilator & ICU Facility Must be Available. ✎ 24 Hours Ambulance & Emergency Facility Must be There. From Date 25th September 2018, Ayushman Bharat Yojana Online Registration is started. Not only the Hospitals but the people will also have to impanel for the scheme. The list of required documents will display at the www.abnhpm.gov.in 2018 Website. The Scheme details are explained here. Hospitals who want to get the National Health Protection Mission details should check out the important Dates to Apply Online for Bharat Ayushman Yojana Registration, Hospital Empanelment, Ayushman Bharat Yojana Registration Eligibility, Scheme Benefits are Listed at this Page. 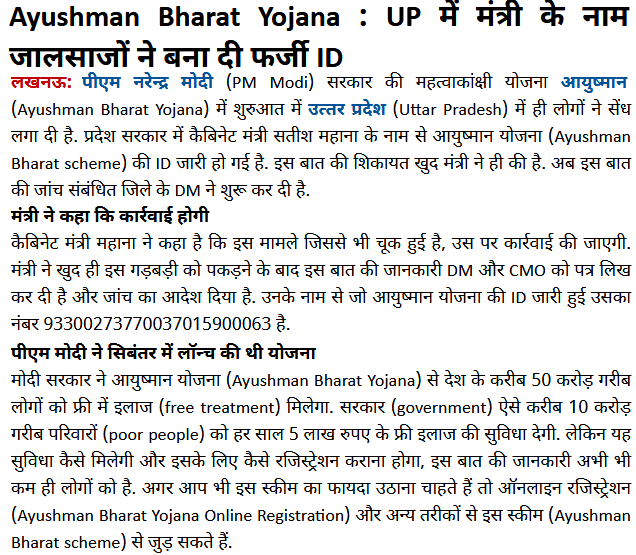 Firstly Go to The Official Bharat Ayushman Yojana Website. There, Scroll Below Down at the “Login”. Now, Fill the “Mobile Number & Captcha”, Click on the “Generate OTP” Button. Provide Your OTP and Submit the Details. Now, On the Next Page, Provide the Details Like Your Name / Mobile Number etc. Select Verification Method from the Drop Down Menu. There You can Check the Eligibility Criteria. Then, From the Page You can Avail the Advantages of Ayushman Bharat Yojna After Completing the Registration Process.